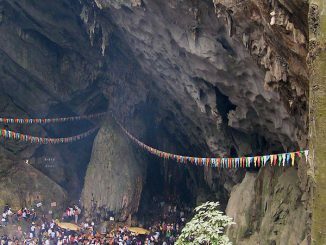 The Dragon Bridge (Cầu Rồng) in Da Nang, Vietnam spans the River Hàn and breathes fire. 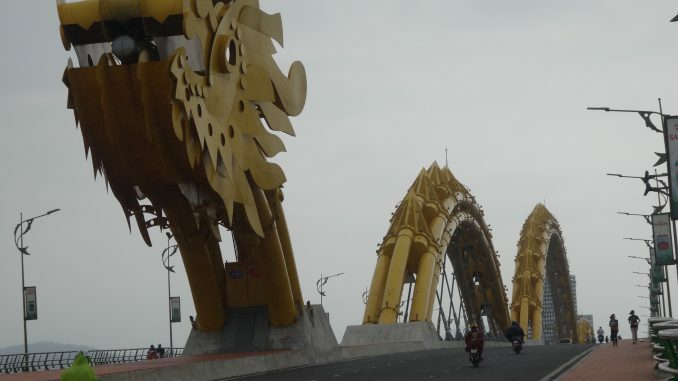 Crossing the Hàn River at the Lê Đình Dương / Bạch Đằng traffic circle, the Dragon Bridge provides the shortest road links to the International Airport as well as other main thoroughfares in busy Da Nang. Construction began in July of 2009 and the bridge was officially opened to traffic on October 26, 2012 on 38th anniversary of the liberation of Da Nang City. The 666m long 37.5m wide bridge designed by United States based Ammann & Whitney Consulting Engineers with the Louis Berger Group Construction was designed to be an attraction as well as a feat of civil engineering. Designed in the shape of a bright yellow dragon, the bridge breathes fire every Saturday and Sunday evening beginning at 9:00 pm.